POS Tablet is a company that offers a wide selection of hardware components for the most popular mobile POS systems and credit card processing services. Though the apps that are out there for accepting credit cards and running a mobile cash register system are very robust, many small businesses are still in need of more features and hardware such as comprehensive inventory, cash drawers, barcode scanners, and receipt printer. That’s where POS Tablet comes into the picture offering everything that you don’t get with the normal providers of these services to give you an honest and true checkout station that will replace your old bulky hardware and eliminate the need for an expensive merchant account contract.POS Tablet leverages the experience and buying power of POS Portal to get you the very best prices whether you buy or lease the equipment. While many software providers already utilize us to distribute their hardware bundles, we understand it is always more efficient to cut out the middle man and buy directly from the source. So now with POS Tablet, you can get the exact same hardware directly from the source at great prices, without long term commitments that tie-up credit lines, eat up cash, or limit your business’ growth. With over 13 years in the POS industry, POS Tablet has created the perfect mixture of experience, simplicity, and customer service. They know all of the apps and software your small business might use for sales and inventory management, and they role that knowledge into the perfect hardware bundles to let your business grow. You can either lease or buy your hardware, and they offer a 30 day money back guarantee. They also offer complete security integration to keep both you and your customers safe when accepting payments and processing transactions. POS Stands that pivot, swivel, and keep your tablet secure. Credit Card Readers that are durable and built for repeated commercial use. Receipt Printers that work with all the most popular POS apps. 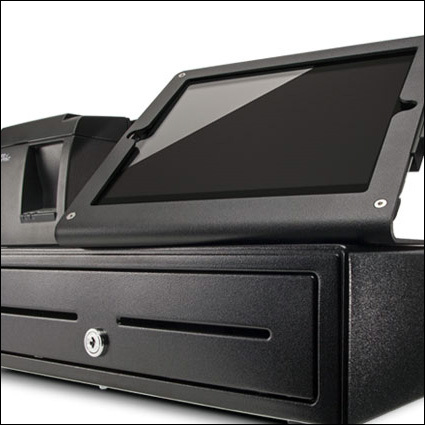 Cash Drawers that open when you accept a cash sale to eliminate push-buttons and security risks.